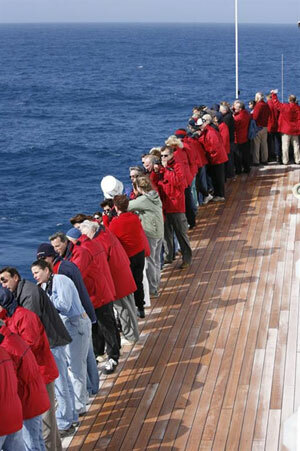 Veterinarians stand on the deck of the “Explorer II” watching humpback whales feeding in the Antarctic waters. Thanks to the North American Veterinary Conference’s RACE-approved continuing education conference, I stood on my seventh continent–Antarctica. Our trip started in Ushuia, the southernmost city in the world. Thirty veterinarians and 170 other cruise passengers took a two-day boat ride on the Explorer II through the Drake Passage. This passage is where the Atlantic and Pacific oceans meet and has some of the roughest water on the planet. Luckily it was more like “Drake Lake” as we sailed to the Antarctic Peninsula. On the ride out we were visited by petrels and albatross that spend their lives wandering these waters. They were attracted to the boat and entertained us by streaking past in the ample winds as we all tried to focus on them with our fancy cameras– a good time for us to practice our focusing techniques for the opportunities to come. Among the several species of seal found in Antarctica, this crab-eating seal posed for Dr. Palazzolo’s camera. and then repeating the process as they fed. In the clear water we could observe them underwater swimming all around us. It was a good way to start our trip! After two days of Drake Lake we made it to our first stop called Deception Island. This was our first chance to don all our gear and head out in the zodiacs. We walked on a beach that had the ruins of an old whaling station and British research station. We also had a chance to take a dip in the frigid waters that had small pools of warm water at the edge of the beach from thermal springs. As we frolicked about we were accompanied by inflatable penguins and crocodiles that someone in our group secretly smuggled onto the beach. We are now official members of the Whalers Bay polar plunge society and have certificates to prove it. 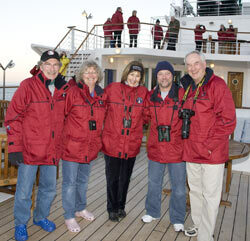 From left, Dr. Ralph Schoemann and wife Joan, Rhonda Barrett, Dr. Dominic Cacioppo and Dr. Ralph Barrett, past-president of the NAVC on the recent CE cruise to Antarctica in February. At the end of each day, the boat crew “recapped” what we actually observed that day. Their approach was a bit more irreverent than you might anticipate by such a professional crew, which added to the ambiance of the trip. An historian, the great nephew of an early Antarctic explorer and scientist, was part of the crew and added a colorful touch of history to what we experienced on our daily zodiac outings. He gave us an appreciation for the unknowns that confronted the early explorers. If you like penguins then you will be in guano heaven! We were surrounded by them–chinstraps, gentoos and adelies. We followed the strict rules about not approaching closer than five meters because of the stress they endure during their molt. These rules did not apply to the penguins though, and if they waddled towards you and happened to nip at your toes then you made a new friend. They entertained us as they waddled around in their custom tuxedos. They probably thought we were the ones entertaining them as they watched us waddle around with our polar gear and life vests as we side-stepped guano mines. Before we were allowed back on the ship we had to pass a crew inspection of our boots for guano. Offenders had to endure the indignity of the guano-matic to clean their boots or else they would be left on the island as our ship sailed to its next destination. As ungainly as penguins are on land, their movements in the water are graceful and fast as lightning. Herds of them would literally streak past us, popping up momentarily, then disappearing like torpedoes. If you wanted to capture them with your camera, you had to focus on the water where you anticipated they would appear and start firing before you even saw them. Needless to say, as we edited our photos later, we had to review lots of out-of- focus and plain-water shots to get a few of the penguins as they flew through the air. 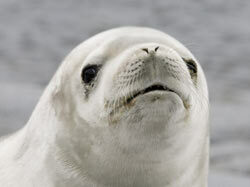 We also saw Weddell seals, crab-eating seals and leopard seals. We basked in beautiful blue skies, helped our captain navigate around untold numbers of icebergs, ate massive quantities of food, contemplated huge glaciers and marveled at the early explorers who risked so much to establish whaling settlements and map the continent. All too soon our trip ended and faced the Drake again. Too bad for some in our group the ride back was not as calm as the ride over. The Richter scale on the ride back was a seven out of 10, which meant 30-foot waves–the captain gave us permission to say they were 50 feet. The crew of our boat was outstanding, the food was great, the boat was comfortable and the company was the best. We received 37 hours of RACE approved credits for various lectures on marine-mammal and exotics medicine. Dr. Carol Walton lectured on birds, whales and pinnipeds of the far south. Dr. Doug Mader lectured on the medical care of turtles, pinnipeds, penguins and cetaceans. Dr. Steve Barten and I lectured on digital photography. We had our own lecture room and most of our lectures took place on the ride out to the peninsula over two days. This gave us plenty of time to enjoy the Antarctic peninsula once we arrived. For most of us, this well-organized trip exceeded our expectations and we can’t wait for the next overseas veterinary continuing-education journey. Antarctica is a trip well worth taking for anyone with a small sense of adventure, an appreciation for the wonders of our planet and a little anti-motion medication. Dr. Palazzolo owns Long Beach Animal Hospital in Long Beach, Calif., and is an accomplished wildlife photographer. More of his photos from the Antarctica trip, as well as photos from Costa Rica and his many safaris to Africa may be found at www.lbah.com.